New Delhi: The Indian Consumers have positively accepted online shopping of products for their personal use in the last few years. However, in the scientific industry, e-commerce has emerged relatively late and now the graph of acceptance seem to climb slow and steady. Against the sales and purchase system of laboratory or scientific products which takes 30-60 days with the on-field visits, quotation, delivery and payment; e-commerce process can be completed within a week’s time. One of the main reasons for slower growth of e-commerce in scientific industry is that it requires advance payment which is difficult with many institutions and companies. E-commerce for scientific industry has seen a lot of developments evolving itself into a user friendly platform. The basic online business model has a website wherein suppliers for different categories of lab products are listed. In B2B websites like Indiamart, you can post an enquiry so that suppliers shall send quote to you. The advantage here is that suppliers can get inquiries from buyers of different locations with minimal investment. However, it does not help in reducing the procurement timeline for the buyer. The above concern made way to more advancement in the online business model wherein products are available to buy online using a secured payment gateway. Since the technical details as well as pricing details are given online, buyer does not require to ask for a quote, and instead just buy online like any B2C shopping site. One such website for laboratory goods, the first one in India, Biomall offers a big list of laboratory products available from hundreds of brands and categorized extensively for the ease of buyer. The platform not only offers an advanced search for comparison of product under different brands but also provide a secured gateway for payment. The advantage here for suppliers is they can get direct online orders and also promote their products to buyers across the world. Through this model, the procurement time for buyers is reduced to just a week as against the 30-60 days buying time of the old system. Almost every buyer, even in remote locations, now possess an internet device, an email account or social media account. It’s this digital ecosystem that every manufacturer or supplier should make use for their business growth. 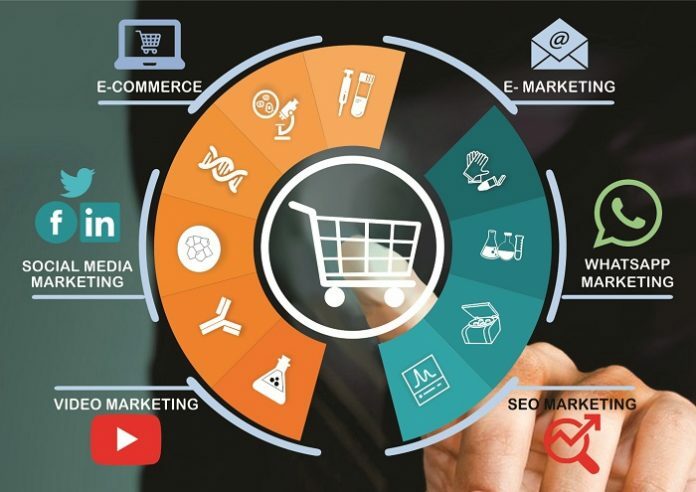 Just an online listing is not enough; supplier needs to employ all digital strategies such as email marketing, search engine marketing, search engine optimization, social media marketing and whatsapp marketing. When these digital strategies are combined with e-commerce, suppliers can get the maximum outcome for brand promotion and global growth of their business. E-commerce websites in India such as Biomall.in, offer a digital marketing package for suppliers in a bid to promote Indian manufacturers of scientific goods at a global level. While the old system of credit payment is still a strong opponent to advance online payment, the e-commerce and digital benefits are being realized and is slowly overtaking the old system of lab procurement.